1992, Hubcap used, 15", 65, BUICK, RIVIERA, 54 SLOT TYPE, WITHOUT SPINNER. 5002a, HUBCAP USED, 14", 67, PONTIAC, FIREBIRD, SLOT TYPE, WITHOUT SPINNER, 26 SLOTS, EMBLEM RED BACKGROUND, BLACK LETTERS PMD, METAL CLIPS. 5002A, Hubcap used, 14", 67, PONTIAC, FIREBIRD, SLOT TYPE, WITH OUT SPINNER, 26 SLOTS, EMBLEM RED BACKGROUND, BLACK LETTERS PMD, METAL CLIPS. 566, Hubcap used, 14", 65, DODGE, DART, CORONET, PASSENGER, WITHOUT SPINNER. 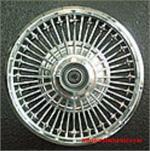 607, Hubcap, 14", 67-68, MERCURY, COMET, COUGAR, WIRE TYPE WITHOUT SPINNER, BLACK CENTER. 631, Hubcap used, 14", 67-69, FORD, MUSTANG, CHROME OUTER RING, RAISED CENTER WITH RED RECESSED CENTER & MUSTANG LOGO WITH WORD FORD MUSTANG IN CENTER, WIRE TYPE, WITHOUT SPINNER, METAL CLIPS. 633, Hubcap, 15", 67, FORD, THUNDERBIRD, 24 SLOT TYPE, WITHOUT SPINNER. 655, Hubcap used, 15", 68, FORD, THUNDERBIRD, POLISHED, 24 SLOT TYPE, CHARCOAL POCKETS, BLACK ENGRAVED WORD THUNDERBIRD IN RAISED CENTER, NO LOGO, WITHOUT SPINNER. METAL CLIPS. 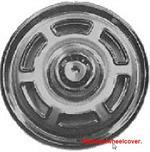 973, Hubcap used 13", 65-66, FORD, FALCON, 6 SLOT TYPE WITHOUT SPINNER. 976, Hubcap used, 14", 65-66, FORD, FALCON, 6 SLOT TYPE, WITHOUT SPINNER. 981, Hubcap used, 15", 65, FORD, THUNDERBIRD, EXCEPT LANDAU, WITHOUT SPINNER DESIGN. 981, Hubcap used, 15", 65, FORD, THUNDERBIRD, EXCEPT LANDAU; WITHOUT SPINNER DESIGN. 985b, Hubcap used, 14", 65, FORD, MUSTANG, CHROME OUTER RING, 8 BLACK RIBS CHROME & BLACK WITH CHROME WORD MUSTANG IN CENTER, METAL CLIPS, ALSO 2 OTHER FINISH AVAILABLE, WITH OUT SPINNER. 992, HUBCAP USED, 15", 66, FORD, THUNDERBIRD, WITHOUT SPINNER DESIGN. O-13, Hubcap used, 14", 64, FORD, GALAXIE, PASSENGER, POLISHED WITH PAINTED BLACK SLOTS, SLOT TYPE, WITH RAISED RIBBED CENTER & BLUE & CHROME LOGO, METAL CLIPS, WITHOUT SPINNER, EXCEPT XL..
O-8, Hubcap used, 14", 63, FORD, GALAXIE, PASSENGER, CHROME, 19 SLOT TYPE, WITHOUT SPINNER, RED WHITE AND BLUE FORD EMBLEM, METAL CLIPS.